These bars scream summer time! I really don’t think they need an explanation other than they are really simple to make and basically taste like summer. 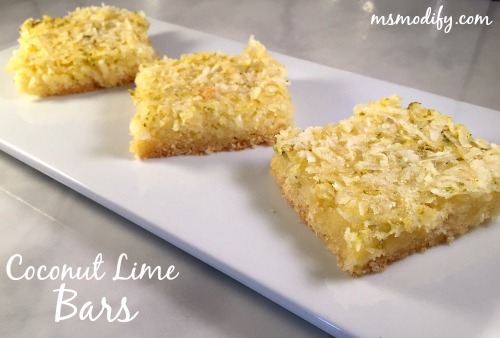 Yup, if I could describe how summer tastes it would be these coconut lime bars! In a mixing bowl, combine dry cake mix, 2 eggs and vegetable oil with spoon. Stir until evenly mixed. Press mixture into the bottom of your prepared baking dish to make your crust. Bake for 15 minutes. While crust is baking, in a mixing bowl whisk together 2 eggs, sugar, lime zest and lime juice until combined. After the 15 minutes, remove crust from oven and pour this mixture on top. Sprinkle coconut evenly on top. Place back into oven and bake for 20-25 minutes or until golden brown. Cool before cutting. Remaining bars should be stored in the refrigerator. This entry was posted in Recipes/Dining Out and tagged bars, coconut, dessert, lime, summer food.